Dwarven weapons and heavy armor are medium-quality items of Dwemer design that are made from Dwarven Metal Ingots. 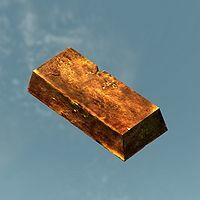 The secret of creating Dwarven Metal was lost with the Dwemer, and therefore it is one of the two metals that can't be mined, the other being Steel. However, the Dwemer left large amounts of scrap metal behind in their Dwarven Ruins, and this scrap metal can be smelted into ingots. Six different types of scrap dwemer metal can be smelted to yield Dwarven Metal Ingots. The following lists all of these scraps, along with the number of ingots that each produces when smelted and the total number of guaranteed samples that can be found. Other metallic items that are found in Dwarven Ruins cannot be smelted, including various other types of dwemer scrap metal and dwemer dishes. A rule of thumb is that if it starts with the word "Dwemer" it cannot be converted, not even Dwemer Scrap Metal; Bent Dwemer Scrap Metal can be smelted. The Small Dwemer Lever is the only exception; its name doesn't start with Dwemer, but it still cannot be smelted. The value of all of these items is proportional to the number of ingots they create (5 gold/1 ingot). However, the weights of the raw items vary widely. Dwarven Smithing requires 30 Smithing skill. Dwarven armor is level 12 Heavy Armor, made from Dwarven Metal Ingots, Steel Ingots, Iron Ingots, and Leather Strips. Dwarven weapons are level 12 weapons, made from Dwarven Metal Ingots, Steel Ingots, Iron Ingots, and Leather Strips. Dwarven Metal Ingots may be sold by blacksmiths starting at level 6 and general goods merchants starting at level 4. All varieties of Dwarven Spiders have a 20% chance of dropping Bent Dwemer Scrap Metal. All varieties of Dwarven Spheres have an 8% chance of dropping Bent Dwemer Scrap Metal. 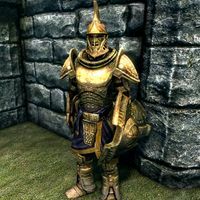 The other five types of dwemer metal each have a 10% chance of 1-3 samples being dropped by all varieties of Dwarven Spheres and Dwarven Centurions. All types of dwemer metal can be randomly found in chests and other loot containers in Dwarven Ruins. If the Merchant perk is unlocked, Calcelmo will have random dwemer metal for sale. The total column provides the total number of ingots that could be obtained if all of the metal in each location was retrieved and smelted. Only locations containing multiple items are included in the following list. Dwarven Smithing is the first perk in the Heavy Armor branch of the Smithing skill's perk tree. Unlocking it requires a Smithing skill of 30, and the Steel Smithing perk must have already been unlocked. Dwarven Smithing allows both Dwarven armor and Dwarven weapons to be crafted. The Dwarven Smithing perk also causes tempering of Dwarven weapons and armor to be twice as effective. This perk applies to both unenchanted Dwarven gear and enchanted gear (generic armor, generic weapons, or custom), as long as the Arcane Blacksmith perk has been unlocked. 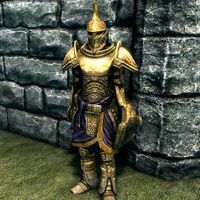 Dwarven armor is a variety of heavy armor that is only better than Iron and Steel (and unimproved BonemoldDB) armors. It appears in leveled lists starting at level 12 (enchanted varieties at level 13). All items can be tempered using 1 Dwarven Metal Ingot, and having the Dwarven Smithing perk doubles the quality improvement. Dwarven weapons are better than Iron, Steel, and Orcish weapons. They appear in leveled lists starting at level 12 (enchanted varieties at level 13). All items except ammunition can be tempered using 1 Dwarven Metal Ingot, and having the Dwarven Smithing perk doubles the quality improvement. Ammunition can only be smithed if the Dawnguard add-on has been installed. †The base gold value used for all generic enchanted versions of the Dwarven Bow is 95 instead of 270. This means that the enchanted weapons are 175 gold cheaper than they should be, and in several cases are cheaper than the unenchanted bow. This bug is shared by several types of bow in the game. ¥The Enhanced Dwarven Crossbow has an additional property: Attacks with this crossbow ignore 50% of armor. The Ancient Knowledge ability, gained from the quest Unfathomable Depths, is supposed to make Dwarven armor 25% more effective when worn (see Bugs). Purchasing any Dwarven armor or weapon will cause the Buy Dwarven artifact quest to start. One Dwarven metal ingot is needed at workbenches to improve Spellbreaker. A full suit of Dwarven armor can be found at Nchuand-Zel Armory, inside an expert-locked door to the right of Erj. All Honed Ancient Nord weapons gain from the Dwarven Perk despite requiring Steel Ingots to temper. Inconsistently, Dwemer scrap metal cannot be smelted, while bent Dwemer scrap metal can. NPCs are not able to properly use Dwarven crossbows due to an animation bug. This page was last modified on 21 November 2018, at 23:45.